We only have a week left before Christmas and I bet you all have your presents lined up under the Christmas tree. Now is the time to relax and get ready for the most wonderful time of the year but not for me because I am still on a rush to shopping and completing my list of persons that I will be giving presents on our Christmas party. Weeks ago, I started buying different greeting cards and gift items little by little so as not to hurt my pocket. And at this moment, I have three more persons left that I still need to buy presents. One is my uncle who will be home from Chicago and will stay here for about a month. I am actually planning of buying him a genuine all-purpose dagger like this SOG Flash II knife that you see on the picture. 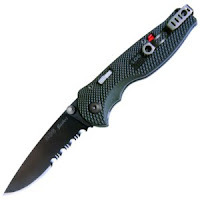 The knife has a 3.5 inch long serrated blade with a black Zytel handle that has a dual thumb studs for ambidextrous handling. The knife is equipped with a security lock for an added protection when the blade is closed. What I like about this knife is it's cheap. You can actually have it for only $50.95 from its original retail price of $84.